ISSAQUAH -- Pit bull owner Peggy Noblitt has moved out of Issaquah Highlands after a long battle with the homeowners' association. But Noblitt, who now lives with her dog, Blu Gator, in an apartment complex in downtown Issaquah, still insists her civil and constitutional rights were violated when Issaquah Highlands banned pit bulls. She isn't dropping her lawsuit against the association. Blu Gator's owner says she has more than lawsuits to worry about, however. Her home is up for sale, she and her boyfriend broke up -- and, she says, she's 4½ months pregnant. As an about-to-be single mother, she hopes her lawsuits will lead to a financial settlement. ``This has cost me everything,'' said Noblitt. Among others, she's suing the president of the homeowners' association and the president of the development company, Port Blakely Communities. Noblitt acknowledges that state law allows breed-specific bans, but she says due process and procedural guidelines were ignored when the ban was implemented. ``You cannot do it in the way you did it,'' is how Noblitt summarizes her claim against Issaquah Highlands. When the ban was first enforced in March, Noblitt and Blu Gator were already living in the development. The homeowner's offered to ``grandfather'' in Blu Gator if Noblitt met certain conditions. Among other things, the pit bull needed to be muzzled, spayed, kept in a secure kennel and covered with a $250,000 liability insurance policy. The rationale for special treatment of specific breeds is based on the assumption that certain dogs are genetically more pre-disposed to lethal attacks. In a special report issued by the American Veterinary Medical Association in 2000, 27 people died from dog bites in 1997 and 1998. According to the report, ``pit bull-type'' dogs and Rottweilers were responsible for around 60 percent of the deaths. Asked if she would be comfortable having her new baby and a 60-pound pit bull living in the same apartment, Noblitt was unequivocal. ``Absolutely,'' Noblitt said. ``They are wonderful with children. Perilous pooch or pit bull profiling? ISSAQUAH - The case of Blu Gator, a 1-year-old pit bull living in Issaquah Highlands, is headed to court this summer. Peggy Noblitt, the owner of the 60-pound, female American Staffordshire terrier, has refused to abide by what she calls discriminatory conditions imposed on Blu Gator by the Issaquah Highlands homeowners' association. Among other things, the homeowner's association has ordered the pit bull to be muzzled, spayed and confined inside a secure kennel when she's in the back yard. Noblitt is also supposed to take out $250,000 of liability insurance. The homeowners' association, backed by Port Blakely Communities, the developer of Issaquah Highlands, wants the court to enforce the special conditions or order Blu Gator out of the residential development. ``Can a homeowners' association adopt and enforce a rule?'' he said. Valerie Bittner, Noblitt's attorney, says the state Supreme Court ruled in 1998 that restrictive covenants for homeowners are legal -- but only if they're applied in a ``reasonable, rational, fair, impartial, prudent and nondiscriminatory'' manner. That hasn't happened with Blu Gator, Bittner said. The homeowners' association says it began enforcing a ban on pit bulls in March. But Blu Gator, in place before the ban, was ``grandfathered in'' by the association with the aforementioned conditions. The rationale for setting special conditions for specific breeds is based on the assumption that certain dogs are genetically more pre-disposed to lethal attacks. In 1997 and 1998, the report says 27 people died in the U.S. from dog bite attacks. Rottweilers and ``pit bull-type'' dogs were responsible for around 60 percent of the deaths. ``The dog is very sensitive to the cues you're giving it,'' Bittner said. ``Without knowing the number of animals in the United States by breed, one cannot meaningfully compute risk,'' Karp said. ISSAQUAH -- The owner of a 60-pound English Staffordshire terrier has been hit with a lawsuit by the developers of Issaquah Highlands. The legal action follows Peggy Noblitt's refusal to comply with special rules for Blu Gator, a 1-year-old dog many residents say falls into the ``pit bull'' category. Noblitt, who describes Blu Gator as friendly and playful, says her dog shouldn't be discriminated against because similar or related breeds have been involved in highly publicized attacks on people. ``The court will either order that the rules be complied with, or that the dog be removed from the community,'' said John Adams, a Port Blakely official. But Noblitt's dog was ``grandfathered in,'' so long as the special conditions were complied with. ISSAQUAH -- The owner of a pit bull and the homeowners' association at Issaquah Highlands might be heading to court. Peggy Noblitt, 37, says Blu Gator, her 1-year-old Staffordshire bull terrier, is being discriminated against by a requirement that she wear a muzzle. But Noblitt's dog was ``grandfathered in,'' so long as certain conditions were met. In addition to the muzzle requirement, Noblitt must, among other things, spay her dog, confine it inside a secure kennel when it's in the back yard and take out $250,000 of liability insurance. 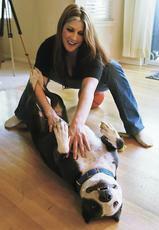 Issaquah Highlands neighbors have nothing to fear from her Staffordshire bull terrier, Blu Gator. Issaquah Highlands developer Judd Kirk said efforts are being made to bring Noblitt into compliance. ``If that can't be done, we'd have to pursue legal steps,'' Kirk said. He declined to say what those steps might be. Noblitt, who has hired a lawyer, says Blu Gator is a friendly dog and shouldn't be penalized for highly publicized stories about pit bull attacks. But Erick Zimmerman, a homeowners' committee member, said there have been multiple incidents of Blu Gator lunging toward children or pets. As for Noblitt's contention that homeowners are on shaky ground with the pit bull ban and special conditions for Blu Gator, Kirk disagrees. Issaquah Highlands' requirements are not unique. Many cities, including Kirkland and Everett, also impose muzzle and other requirements on pit bulls. If her dog became aggressive or dangerous, Noblitt says, she would put Blu Gator down. Fighting for equal treatment of her pet has been expensive. Those legal costs may escalate as the standoff continues. Noting that Noblitt has not complied with the required conditions, Zimmerman says the homeowners association has few options. ``Our only choice now is to take the next step,'' Zimmerman said.